← Dairy Made Easy: Exclusive Author Interview + Giveaway! Mountain Family Author Speaking Tour! After speaking all over Israel and inspiring hundreds of people, Tzirel Rus Berger will be embarking on a North American speaking tour! 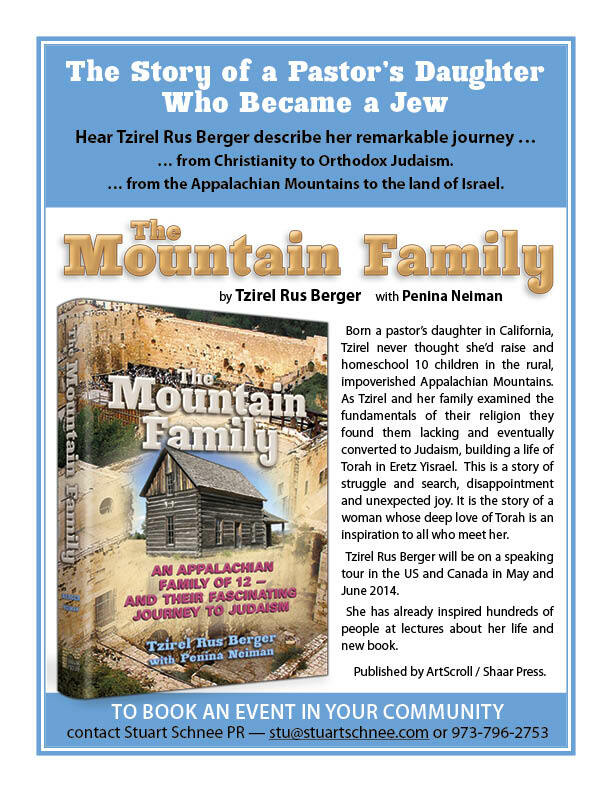 The author of ArtScroll’s best-selling Mountain Family will be in America delivering her inspiring talk to audiences across the country! To book an event in your community, contact Stuart Schnee: stu@stuartschnee.com or 973-796-2753. I heard her speak in Jerusalem. She is incredible; her lecture was fascinating, entertaining and inspiring! Is it possible to make a giveaway raffle for this book? Tzirel rus has taught me and my children the value of being a jew. and my family’s struggling with yiddishkiet is over . they now are so proud to have been born a yid. Where can I find out when and where she is speaking in the USA, specifically in California, hopefully, San Diego. Please contact stu@stuartschnee.com for details!